This month, we feature a hot ’64 Chevy Impala that we found while walking around at the Lowrider Tour stop in San Diego, California. We spotted this clean ’64 on jackstands and the car seemed to have a little bit of everything on it. The closer we got, the better the car looked. We found out that the car was built by Mark Turner of Major League Customs in San Diego, and was put together for Jacque Jones of the Chicago Cubs, who always wanted a lowrider as well as a big-leaguer. This project was a home run as the team redid the complete car from the frame up. The two-month project included painting everything in the engine compartment to match the exterior of the vehicle. The new crate engine block was painted and outfitted with chrome-plated and polished accessories. The steering was upgraded with a 605 gearbox, and power brakes for extra stopping power now that the vehicle has a bigger engine. This Impala has it all-paint, undercarriage and interior. Don’t be surprised to see this San Diego-built ride featured in an upcoming issue of Lowrider Magazine. If you feel that you have an engine worthy of our From The Hood section feel free to contact us at saul.vargas@primedia.com. 1. 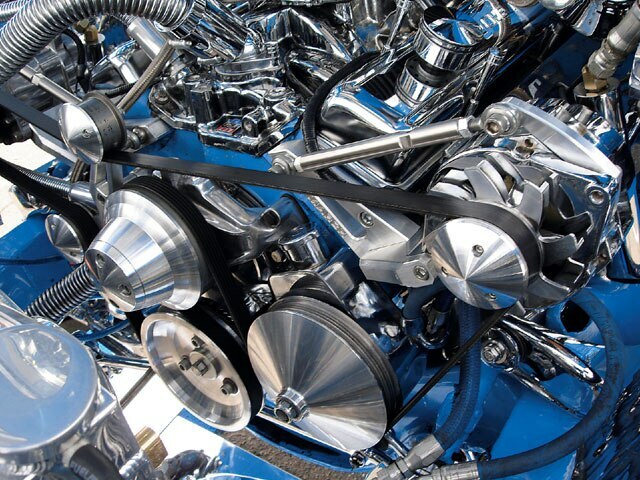 An Edelbrock intake with a 650-cfm Holley carb were used to feed the swapped-out newer-style small-block.2. March pulleys and serpentine brackets were used on the belt system to drive the power steering, A/C and 100-amp alternator that charges up the Optima sealed battery. 3. 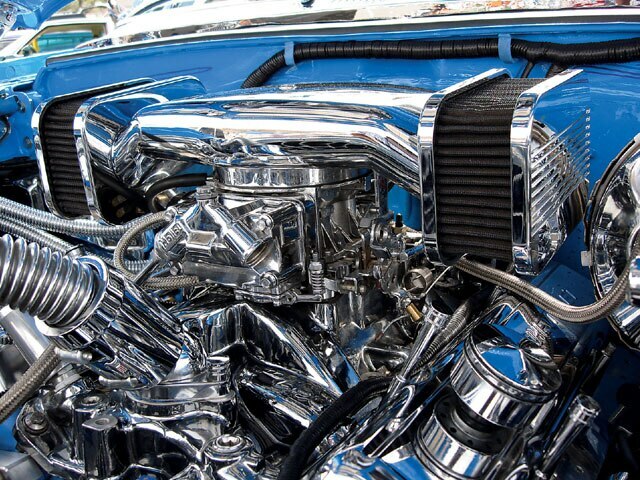 An aluminum Be Cool radiator with a billet Spal covered electric fan keep the engine running cool.4. Cool Flex hoses flow the cooling fluids.5. 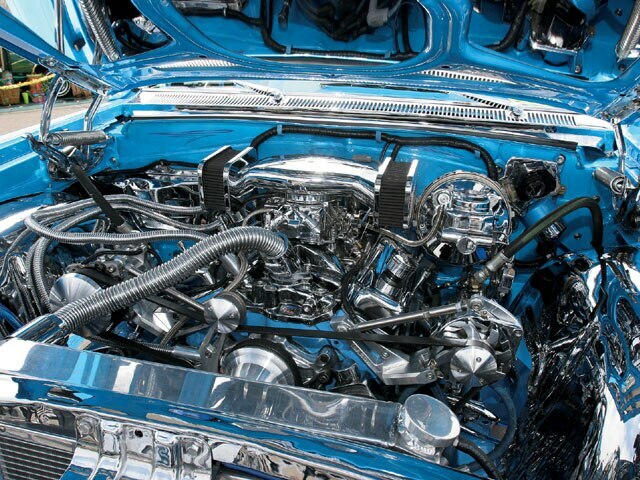 Chrome was used throughout the engine compartment to accent the paint.